Do you know who invented the Western blot? Was it Neal Burnette (at Fred Hutchinson)? Was it Harry Towbin's group (in Switzerland)? Was it George Stark's group (at Stanford)? 1979 certainly was a busy year in the development of western blotting (also called "Protein blotting" or "Protein immunoblot"). They were all working hard and trying to publish. But who deserves the real credit? 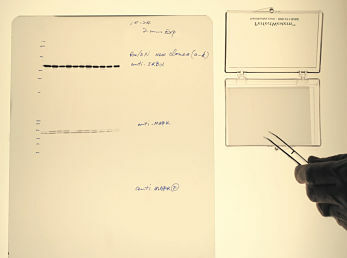 Most researchers know western blotting evolved from Southern blotting (Ref 1), invented by Edwin Southern at University of Edinburgh in 1975, then northern blotting (Ref 2), invented by George Stark's Stanford group in 1977. All 3 groups of researchers in Seattle, Stanford, and Basel seem to have been working independently from 1977 to 1979 on a better method to detect proteins using antibodies. They all attempted to publish in 1979 and certainly all deserve some credit for the development of the western blot. But who should we cite as the real inventor? This question is not as easy to answer, but it is a very interesting story. George Stark's group at Stanford University, including Jaime Renart & Jakob Reiser, published first (Ref 3), submitting in April 1979 and published in July 1979. They used passive transfer of the proteins, then 125-I-labeled Protein A for detection. Harry Towbin's group in Basel, Switzerland, including Towbin & Julian Gordon (at Friedrich Miescher Institut) and Theophil Staehelin (at Hoffmann-La Roche), submitted in June 1979 and was published in September 1979 (Ref 4). They developed the method of electrophoretic transfer of proteins to membranes (instead of passive transfer like Stark) and the now-ubiquitous immunoblotting sandwich using electric current to transfer proteins from the SDS-PAGE gel to the membrane (Ref 5). Their procedure also used secondary antibodies for detection; thus, this appears to the actual method that is generally followed for westerns. W. Neal Burnette, working in Robert Nowinski's lab at the Fred Hutchinson Cancer Research Center in Seattle, submitted in 1979, but it was rejected, then eventually published in 1981 (Ref 6). Burnette definitely gave the technique the name "Western blotting" as a nod to Southern blotting and because their lab was on the west coast. He developed his technique independently, including the electrophoretic transfer step, but became aware of Stark's and Towbin's publications before he submitted his in 1979. He still believed his version was simpler and more universal, thus worthy of publication (Ref 7). He mentions using "unmodified nitrocellulose, radiolabeled Protein A detection, and 2-D separations" as advantages (Ref 7). He also said his method "simplified antigen transfer, antibody detection, and complex visualization" (Ref 8). Interestingly, Burnette reports that his submission in 1979 was "dismissed - not on the basis of the Towbin publication but because the technique was transparently obvious, made no fundamental contribution to the scientific literature, and, most damning, had been given the flippant name of 'Western blotting' in honor, of course, of Edwin Southern and of the West Coast location of its invention." (Ref 8). His procedure was finally published in 1981 after it had already become famous through distribution of pre-prints to friends, who repeated the process (Ref 9). "Pretty soon, I was running a daily seminar on blotting by telephone. I was talking to everyone...because they couldn't read the Xeroxed copy they had. [Western blotting] was taking up all my time by talking on the phone." (Ref 9). So, who actually invented the western blot and should be given credit for it? Stark's group published first. Towbin's group developed what appears to be the most common method, including the electrophoretic transfer method and buffers, as well as the use of secondary antibodies. Burnette gave the technique the name among other modifications and was very instrumental in popularizing western blotting. In a 2005 Nature Methods Classic Protocol (Ref 10), Michael Eisenstein wrote "It is arguable...that Burnette's most significant contribution to immunoblotting came when he christened the technique 'western blotting'". When many researchers cite western blotting, they often will reference both Burnette's and Towbin's papers, so perhaps the most accurate answer is that both of them should get credit, but we leave it up to you to answer the question for yourself. We hope you enjoyed this story and the background behind a technique many of you use every day in your lab. We always find it fascinating to learn more about the history of techniques that have become so vital for exciting and life-saving discoveries around the world. For additional background information and more interesting stories and insight into the development of this procedure, we recommend the references below. The information presented here is accurate to the best of our knowledge, but we welcome any feedback you might have as to your thoughts on the subject, your experiences/personal knowledge, or any other insight - there is always more to the story than what gets published in the public domain. You can contact us by email at info@genhunter.com. Our PerfectWestern Containers are available in 38 different sizes and have ultra-smooth flat surfaces, lids, and 90 degree edges to perfectly accommodate Western blots of all sizes, significantly reducing the amount of antibodies needed (often by 75%), while still giving beautiful blots. You can download our PerfectWestern catalog here. The PerfectMembrane is available in 3 different standard gel sizes, in 4 materials (3 types of PVDF and Nitrocellulose), and is generally about half the cost of other pre-cut membranes. Our PerfectFilm is a high-quality, especially sensitive blue autoradiography film that is ideal for most applications including Western blots using ECL substrates for HRP or AP! The PerfectRocker offers the standard back-and-forth rocking motion preferred by many labs for Western blots. It also includes adjustable speed (2 to 30 RPM) and adjustable pitch (0 to 30 degree tilt angle). The new PerfectWaver, Belly Dancer, and Belly Button Orbital Shakers have a unique 3D undulating orbital motion that is ideal for Western blots, but also work for many other applications. These shakers are extremely durable and allow perfect membrane movement. 1) Southern, EM: Detection of specific sequences among DNA fragments separated by gel electrophoresis. (1975) Journal of Molecular Biology 98:503-517. 2) Alwine JC, Kemp DJ, Stark GR: Method for detection of specific RNAs in agarose gels by transfer to diazobenzyloxymethyl-paper and hybridization with DNA probes. (1977) PNAS 74:5350-5354. 3) Renart J, Reiser J, Stark GR: Transfer of proteins from gels to diazobenzyloxymethyl-paper and detection with antisera: a method for studying antibody specificity and antigen structure. (1979) PNAS 76:3116-3120. 4) Towbin H, Staehelin T, Gordon J: Electrophoretic transfer of proteins from polyacrylamide gels to nitrocellulose sheets: procedure and some applications. (1979) PNAS 76:4350-4354. 5) Towbin H: Origins of Protein Blotting. (2009) Protein Blotting and Detection: Methods and Protocols, Biji T Kurien and R Hal Scofield (eds.) Methods in Molecular Biology. 536:1-3. Humana Press/Springer, New York, NY. 6) Burnette WN: "Western blotting": electrophoretic transfer of proteins from sodium dodecyl sulfate-polyacrylamide gels to unmodified nitrocellulose and radiographic detection with antibody and radioiodinated protein A. (1981) Analytical Biochemistry 112:195-203. 7) Burnette WN: Western blotting: Remembrance of Things Past. (2009) Protein Blotting and Detection: Methods and Protocols, Biji T Kurien and R Hal Scofield (eds.) Methods in Molecular Biology. 536:5-8. Humana Press/Springer, New York, NY. 8) Burnette WN: Western blotting. Clinical Chemistry (2011) 57:132-133. 9) Mukhopadhyay, R: W. Neal Burnette: The man behind the Western blot. ASBMB Today. (January 2012) pg 17-19. The American Society for Biochemistry and Molecular Biology, Rockville, MD. 10) Eisenstein, M: A look back: westward expansion. Nature Methods. (2005) 2:796. Best of luck and enjoy getting PerfectWestern blots!